While many vitamin C products on the market contain synthetic forms of vitamin C like ascorbic acid, this product contains the full vitamin C complex that naturally occurs in organic acerola cherries, one of nature's best sources of truly natural vitamin C.
Most conventional vitamin C supplements in pharmacies and grocery stores contain only a portion of the full vitamin C complex, typically just ascorbic acid or ascorbate, which represents the outer ring that surrounds the full vitamin C complex. The full vitamin C complex is composed of several different factors that work together to keep teeth and gums healthy, support hair health, facilitate tissue healing, and help prevent premature aging. These factors include rutin, bioflavonoids, ascorbinogen, tyrosinase, and various co-factors. Whole foods like acerola cherries and amla berries come with the entire vitamin C complex which can efficiently reach and nourish all of the cells of your body. Since 2003, I have been using and recommending our organic green food blend, which contains a small amount of natural vitamin C. At the request of many of our newsletter subscribers who have a special need for larger amounts of natural vitamin C, we added this stand-alone organic acerola cherry powder to our catalogue, and to optimally preserve nutrient integrity, it comes in an amber-colored glass jar with a metal lid. For more than a decade now, I have been recommending intake of organic acerola cherry powder for a variety of health challenges. In particular, I have found organic acerola cherry powder to be measurably helpful for people who experience frequent infections, slow wound healing, weak teeth and gums, unexplained joint pain, and chronic fatigue. Suggested Serving Size: 1 scoop (included), equal to about 1.5 teaspoons or 5.7 grams, providing approximately 256 mg of vitamin C from organic acerola cherries. How do you take acerola cherry powder? Mixed with water, a fresh vegetable juice, fruit smoothie, nut milk, or with a quality organic green food powder. It's worth noting that you can take more than the recommended serving size of 1.5 teaspoons if you feel you need more natural vitamin C for a health concern - being organic food and free of synthetic nutrients, there is no potential to experience toxicity. Organic acerola cherry powder is naturally buffered, meaning that it is not highly acidic, making it fine for people who find that regular synthetic vitamin C supplements are uncomfortably acidic. I also have tried this product and found it very effective and easy to digest. It was interesting to notice people my age (over 50) complaining about this and that ailment and realizing that I did not have the same complaints. I felt good and happy with loads of energy. Between taking the acerola cherry powder and 100% whole food tablets, I feel very good. I use the acerola cherry powder in smoothies and I love it. I haven't had a cold or sniffles since I started using the vitamin C powder. This is the only thing I'm doing differently, so I have to conclude that the powder is working. When I take this product, I remain free of current cold or flu outbreaks in my area. This is a great product and I wouldn't want to be without it. Tastes pretty good also. Acerola cherry powder is a wonderful product and I feel it helps offset the things I do to my body that I shouldn't. I also make an incredible "detox" full body and facial scrub using a couple tablespoons each of Vitamin C power, Super Green Food powder and approx 1/2 cup of granulated Sea Salt mixed with a small amount of water. Makes my skin feel great and incredibly seems to take all body odor away for a couple days! I do this atleast once a week. "...easy to mix and has a very pleasant taste." I mix a spoonful in water along with the green food powder. It is always settling to my stomach and I really believe it helps me stay healthy! On my second jar.....appears to be working well. I like it very much. Felt it reduced subdermal bleeding and capillary fragility I experience. I have been using this Vitamin C powder for a few years now and feel great. I get sick rarely and my skin is bright. My only frustration is the bottle opening with the scooper. it is hard to access the powder. Not only do I enjoy knowing this is good for me, but when mixed with cold water, it's a deliciously tart, refreshing drink. Great product and so much better than the fake Vitamin C on the market. I'm getting some for all of our family! 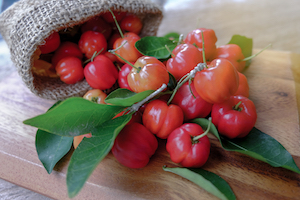 I have been using Dr. Ben Kim's Organic Acerola Cherry Vitamin C for several years now. I mix it with his Organic Greens powder in a tall glass of water every morning. I have been doing this for 3.5 years without missing one single day. I am a nanny, and have worked with a LOT of sick children over the years, and not once have I ever gotten sick or missed a day of work. I am 52 years old, and recently my doctor told me (after a full lipid/metabolic panel) I am healthier than most 30 year olds. I definitely attribute my excellent health to Dr. Ben's Organic Greens & Acerola Vitamin C, along with eating a clean, nutritious whole foods diet. Dr. Kim also has amazing recipes and other resources to aid in optimum nutrition. I especially love the fact that he attended school in Chicago, which is where I reside. He has earned my full trust and respect over the years. I love this cherry powder. It has a great slightly tart taste and lasts a long time. You can't beat the ingredients. Perfect for beginning signs of colds, or if you have reoccurring UTIs. This is by far the best Vitamin C I have found. I use to scoops in a 22 oz jar of water every morning and have not been the slightest bit sick since. My skin is blemish free, more evenly toned and supple. I am 95% better because of this vit c. We never get sick! Love it!! I just want to expand upon an earlier review. As I had said, I use about half a scoop of this in every glass of water I drink throughout the day (and sometimes a full scoop), b/c I require the extra nutrition. The very awesome "side benefit" to me taking all the extra vitamin C I felt I could use is this: my neck had been in pain for about 10 years. I've had 3 MRIs, facet joint injections in my c-spine and botox shots for pain (neither injections helped), been to physio and sometimes wore a cervical collar b/c I couldn't hold my neck up when walking and it would droop down toward my chest, which made my trapezius muscles extremely sore and inflamed at the back of my neck from constantly trying to bring my neck back up into position. Since taking all this vitamin C, my neck feels so much better! I am even looking for a job, b/c I don't feel "disabled" anymore! I doubt I'd have this result, though, from any of the other "fake", synthetic vitamin Cs out there. And so, what I know for sure now is that good and real vitamin C has the power to heal so much more than just colds and the flu. It's almost a miracle for me, after trying everything else. Who knew? But, the most important part is that I don't even require the strong opioids I've been prescribed for years, either. Thank you, Dr. Kim, for making this stuff, and thank the Lord for perhaps leading me to try it. I was *this close* to having surgery, which I certainly didn't want, but was getting to the point of trying anything. Phew, that was close! But, it seems all I needed was a daily, steady dose of good C and my body healed itself, which it has the power to do if it receives what it needs. I am so grateful. Love this Vit C! It's my absolute favorite. Awesome quality. Taking it daily, since about 5 years ago. We add this to the Greens Formula and Whole Food Multi in juice. Besides it obviously being good for us it adds a tangy flavor that my kids and I love and make our green juice more enjoyable. This is my go-to Vit C. I take it every day mixed into warm water with lemon or in a smoothie. Love this stuff! I love this product, as it comes from a natural food source. It is difficult to find any other vitamin C that is not synthetic. I am grateful to have found this one! My favorite Dr. Kim product. I mix it into my morning smoothie, with a little stevia. I put about a half scoop in each glass of water I sip throughout the day, b/c I require this extra nutrition. It mixes up nicely, dissolves completely in no time, turns the water a pinky colour, and doesn't bother my stomach at all. This, in turn, helps me to drink more, b/c I know there's vitamin C in the glass. I swear my body feels better from this! I have been using Dr. Ben Kim's Vitamin C powder for many years now and I can't say enough about it. There was a time I would catch a cold during my menstrual cycle every month. I have a compromised immune system and I become run down very easily. I would also become ill if I was travelling (as soon as I would relax - BOOM - I would get sick). I take 3 tsps. daily in my morning breakfast smoothie and I hardly ever catch any colds or flus now. My Mom noticed when I would visit that I wasn't sick on the couch for a week of my stay - hurrah! Honestly this organic acerola cherry powder is a miracle in my life! I would do commercials for it, I believe in this product that much. 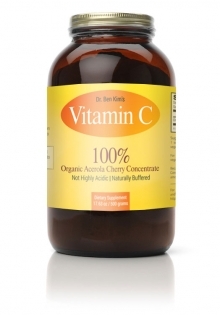 I have been using Dr. Ben Kim's vitamin C for going on 6 years now. I remember because I asked him for some advice in 2009. I would bruise really easily and my gums would bleed even with the softest bristles. These problems disappeared within 6 months of taking this, I haven't stopped taking it, and I am completely free of both issues. I love that the newest version is 100% organic acerola cherry powder without any trace amounts of maltodextrin. It feels so pure and is a breeze to digest. Only been using 2 months but loving it. Cold free, bruising reduced too. I mix it with supergreen powder and real pomegranate juice and beetroot juice in Ben Kim's mixer bottle and keep in the fridge. That way I have a ready supply everyday- it's usually my breakfast. I was u fortunate to get a tummy bug recently but I was still able to sip this formula throughout the day even though I couldn't keep any food down. After 24hrs I was fully recovered and didn't have that awful lightheaded feeling the next day.i was back to normal. I love it that I can just mix this powder in water. That means no unnecessary extra calories or sugars. I am wondering, though, about when the directions say 1.5 teaspoons, does that mean like a medicine teaspoon or any type of kitchen baking teaspoons? I would like to know if I am getting the correct amount. The product is good but to me suspiciously sweet and I am concern about maltodextrin. It is made out of corn but there is no indication that this is nonGMO product so this means that it is GMO corn and maltodextrin is just artificial sugar so how much is added? Been using this for 8 days now with Super green and Norwegian cod liver oil. My skin looks better and I have more energy. Plus I feel Healthier, will buy again. Bev, we don't add dissolving agents to keep this product 100% whole food. I suggest using a blender or a bottle with a cap and mixing vigorously. I AM ON MY 1ST BOTTLE AND FIND IT VERY DIFFICULT TO MIX IT THOROUGHLY. this is a great product, but it would be really helpful if it came in a wide mouth jar. It's difficult to access the powder when it's less than half full. I was surrounded by sick people all winter at my job. I did not get sick once! Thank you Dr. Ben Kim! This is a wonderful product! The taste is great. I mix it in filtered water and don't add anything else. A few fun facts: Ascorbate is required for a range of essential metabolic reactions in all animals and plants. However, unlike most organisms, humans do not make it internally. It is an anti-oxidant, since it protects the body against oxidative stress. Vitamin C is essential for the building of collagen. No heart or blood vessel or other organ could possibly perform its functions without collagen. No heart or blood vessel can be maintained in healthy condition without vitamin C.